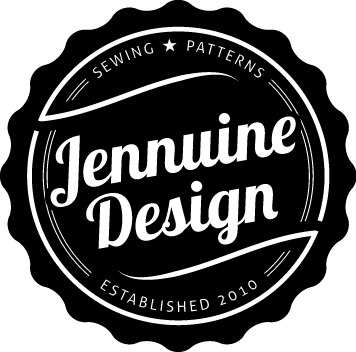 I had the pleasure of testing Jennuine’s Skiff Tee pattern (here) which Miss Socialite really likes. So when Jenn was looking sewists to test the Skiff Tee Dress Expansion I just about leaped at the opportunity. The Skiff Dress expansion pack is designed to be used along with the original tee pattern (but can be used alone if you prefer the sleeveless dress). It adds dress length body pieces offering either a straight or curved vented hem, an optional shoulder flounce, and an optional drawstring waist. I loved the options for this top and the dress adds even more! Monochrome or colorblock, no pocket or pocket, solid or colorblock sleeve, short or long sleeve, curved or vented hem, cinch waist or straight or flounce or no flounce. This is her serious face. Jenn recommends light to medium weight knits with at least 25% stretch (think jersey, ponte, french terry). I think this rainbow striped fabric is an cotton interlock, which I don’t typically love, but I couldn’t pass up the colorful stripes and I think this was a steal from my local remnant store. I used some red ponte scraps for the upper bodice and flounce. I sewed a size 10 because it worked perfectly for the tee. Once again the instructions were very clear, despite the many options, as were the illustrations. Go ahead and grab your ASAP (here)*. 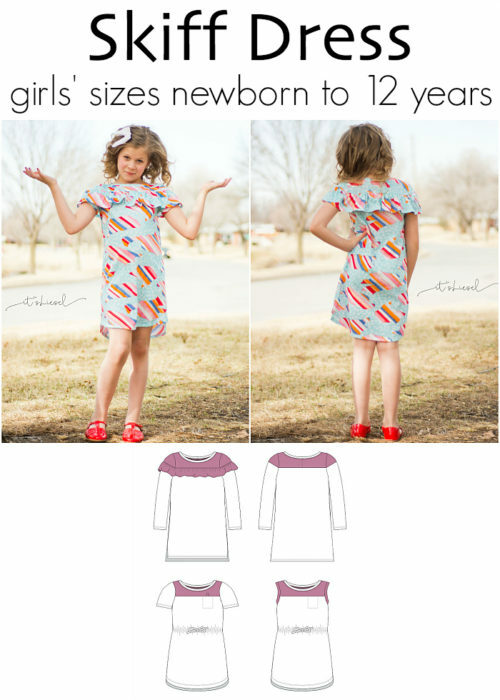 If you already have the Skiff Tee the Dress Expansion is currently $2 (reg price $3) and if you don’t have the tee pattern it would be best to go ahead and grab the bundle for just $7 (reg price $10). Fabric Used: Red Ponte and rainbow stripe interlock jersey from my stash. Likes: Wide neck, flounce and all of the hem, sleeve and bodice options. Would I sew it again? Yes, I’m going to pair some fabric scraps with solids or other patterns. Conclusion: Very versatile tee and dress pattern. *Please note that this link is an affliate link, but that that has no bearing on my review. I was provided this pattern for free in return for my feedback as a pattern tester. 1 reply to Skiff Tee is now the Skiff Dress!